The Elusive Milky Way – How to Find It! This is Part 1 of a multi-part series on finding and photographing the Milky Way. From November through February it is impossible to spot the densest part of the Milky Way because the sun is hovering there. Read on for more information. We are located in a corner of the heavens of a galaxy we call “The Milky Way.” The Milky Way stretches all the way across the sky and some part of the Milky Way is present every night – indeed EVERY star you see in the sky is located within our Milky Way. Most people, however, think of the Milky Way as the cloud-like stretch of stars from the constellation Scorpius (aka Scorpio) to the constellation Cygnus – particularly the part nearest to Sagittarius. I’ll try not to be too poetic, but when you have clearly seen the Milky Way, it is hard to describe how awesome it is without breaking into song. In ideal conditions the diffuse light of the Milky Way can cast a shadow on the ground! Unfortunately there is little chance that you will ever see that shadow because most accessible places in the world are mildly to HORRIBLY light polluted. Constellations that are found in the Milky Way include: Perseus (off the bottom), Cassiopeia (near the bottom in the picture above-left), Lacerta, Cygnus (near the center), Aquila, Sagittarius, Ophiuchus and Scorpius (very top). Those in the Southern Hemisphere will also find Norma, Circinus, Crux, and Carina. There is a faint portion of the Milky Way visible in Puppis, Canis Major and the bow of Orion. Look carefully at the image above and you’ll see a bright “smudge” in the center of the bottom fourth of the image. That is one of our sister galaxies known as Andromeda. The galaxy gets its name from the constellation in which it is found. With an unaided eye it is readily possible to spot Andromeda in a dark sky. With binoculars Andromeda is observable even in a suburban area. In the southern hemisphere two additional sister galaxies called the Large and Small Magellanic clouds are easily seen. On a dark clear night it is easy to observe the lack of stars in the broad band of wispiness that forms the Milky Way. But the dark void is not due to the absence of stars. The void is due to immense inky dust lanes that obscure the stars! The sun is in the constellation Sagittarius in December so during November, December and January it is impossible to view the richest part of the Milky Way. October and February are generally impossible, too. The optimum viewing time in the Northern Hemisphere is in the summer when the sun is on the opposite side of the sky. Unfortunately summer in the Northern Hemisphere is also when hot, stormy, cloudy weather is doing its worst and also when the nights are the shortest. Those in the Southern Hemisphere have an advantage – longer and cooler nights during winter mean the air is clearer. Using a simple tool called a planisphere it is easy to predict when and where to look for the dense part of the Milky Way. But what must also be factored in is the location and phase of the moon. The time of year and the direction of the least light pollution also frame the parameters for getting the best view of the Milky Way. Generally the dense part of the Milky Way is best viewed when it is as high as possible in the Southern sky. Facing south during April and May the pre-dawn hours are best. From June to early August the best time is near midnight, though the Milky Way will be visible almost all night. From Mid August through September the best time is soon after the sun has set and the sky has grown dark. Below is an illustration that may help you. It was created for 38 degrees North latitude, but will serve the middle of the United States, Southern Europe, Northern China, Japan, and any location at a similar latitude very closely. The farther North you go, the lower in the southern sky the Milky Way will be. If you live above 65 degrees north, you will never see the Milky Way core because it never rises above your local horizon. The circle in the image below indicates the star Alnasl in the constellation Sagittarius. Above Alnasl (the spout of the teapot) is the center of our Milky Way Galaxy. *1Q means first quarter moon (half full). In its first quarter the moon rises around noon and sets near midnight. 2Q is a Full moon. Nearly full is called a Gibbous. It is nearly impossible to see the Milky Way when the moon is near full. 3Q is the third quarter (also half full) moon which rises near midnight and sets near noon. New means the moon rises and sets very near the sun. Includes a slender crescent phase, too. Central Nevada, Eastern Utah. Montana. 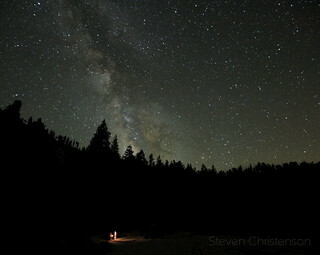 In short, remote areas far from city light pollution afford the best view. But if you know what to look for and when and where to look you can spot the Milky Way from many places throughout the world. Or you can wait for a massive regional blackout. I have seen the Milky Way very clearly from the top of Mission Peak in Fremont, California – an area with over 8 million people in literally every direction. However that glimpse required that the entire Bay Area be blotted out by low, heavy fog. My perch was above the darkness blanket that the fog provided. 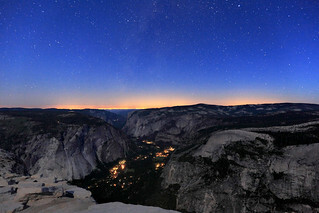 Yosemite National Park is still mostly dark despite cities like Fresno that are doing their best to ruin the darkness. Anywhere along a remote area of the coast far from cities there is a chance to see the Milky Way. For example, I spotted a washed out Milky Way just 8 miles north of Santa Cruz, California. A long exposure and some photo editing improved the view. If you get farther away from civilization the results can be much more spectacular as you see here. Finding somewhere in the country where it is truly dark, like the Black Rock Desert in Nevada, or White Mountain in Central, Eastern California the Milky Way reaches its most inspiring awesomeness. If you live outside the United States, do not despair, you have a good chance of seeing the core of the galaxy from anywhere south of 55 degrees northern latitude. Above that latitude the core of the Milky Way will never rise above the horizon. I know what you’re thinking: don’t I just “look” in the right direction? The answer is no! It takes your eyes 15 to 20 minutes to see their best in the dark. Any bright light source in the direction you look will diminish the view. Running out of a well-lit house, or jumping out of a car where you’ve spent the last 15 minute driving with the headlights on will make the Milky Way far less awesome. Avoiding ALL light and shielding your eyes from anything you can’t avoid will help a lot. 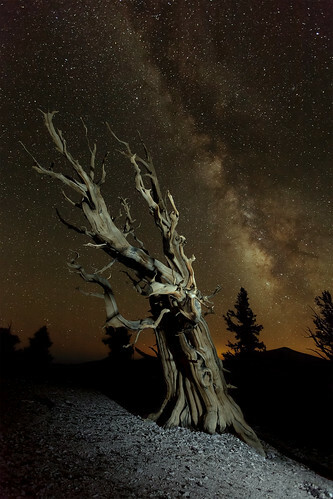 Do you see the Milky Way in this photo from the top of Clouds Rest in Yosemite? I promise you it is there. It juts out above the Yosemite Valley near the center of the image. Here is a view from the wilderness in Yosemite. Can You Help Me Find the Best Time Where I Live/Work/Travel? In short, no. Please read through the comments for many such questions and answers. It’s impossible to cover information for everywhere on earth, but our notes here cover all the general concepts. Moreover, the moon phase is different – the moon doesn’t behave like the sun, so even though the Milky Way may be glorious this year on say August 8th, next year the moon may be full and obscure your view. Also, weather conditions may affect your view, so do not neglect that variable! How Do I Photograph The Milky Way? Cameras are getting better all the time, and there are some nifty tricks you can use to make a compelling photograph of the Milky Way even if your camera is not the top heavyweight performer in the gear smack down. We’ll cover cameras and techniques in installment 2 of this series! This entry was posted in Astrophotography, Composites, Noise Reduction, Photo Tip, Stacking and tagged aquila, cygnus, dark skies, high ISO, milky way, ophiuchus, Sagittarius, Scorpio, Scorpius, teapot on June 26, 2012 by Steven Christenson. What part of the article was unclear? The viewing tips, and Best Times (table) apply everywhere in the world… though as the article says, not everywhere in the world can view the dense part of the Milky Way. My honeymoon ‘ll be in March and im planning to fo t Thiland than i want to see the mailky way,where do you thing i should travel to see the mailky way in the middle of March ? I’ve never been to Thailand, so I’m afraid I cannot offer any advice on where it may be dark and clear. However for the middle of March, as indicated by the article in “Best Times to Spot the Milky Way” will require you to get up well before dawn and look low in the South East. It looks like the moon phase will be favorable for you, and the low latitude of e.g. Bangkok (13.7 degrees) means the Milky Way will be higher in the sky for you than for those located farther north. Hey, Kayla. Missouri, huh? We know nothing about that area of the US so can’t help you more on where to go. As for settings, I’d suggest using the same settings you’ve been using (I assume you’ve also read the companion article The Elusive Milky Way – Capture an Image). You may need to do some creative processing to pull out the Milky Way in light polluted skies – while the article addresses noise, it applies also when trying to pull details out of faint images. As for best lens: we have an article on choosing a lens for night photography that may help. Kayla I’m from the mid Missouri area and there are a decent amount of places you can still capture the milky way at. There are a lot of spots down south of Jefferson City and to the and north of Columbia. If you have Facebook just search or photography groups in your area and that will help lead you to some spots. I’m in NE Kansas, so understand your plight. Yry checking this site. It might help wherever you decide to shoot! Yes, and our article on Finding Dark Skies may also help with other considerations that are important. thank you for such a wonderful article. I know the best place near los angeles, the great Joshua tree, but recently I got fascinated about el matador beach and beautiful caves give awesome foreground. I am planning to head there and heard that I might need to go during low tides, which is around 3am, I hope the milky way is still visible around 3 am ? You can use Stellarium or an online sky map generator to check. Bad news at the moment… As of May 3-8, 2018 the moon is quite full and likely to wash out the Milky Way. Indeed, on May 5, the moon is sitting right in the dense part of the Milky Way at about 80% illumination. As for Joshua Tree, I was rather disappointed in the light pollution last I was there. hey Steven…. I’m from Philippines actually but I’m in Peru now which is I’m located at high mountains which is so cold and freezing, I know that I’m in Southern Hemisphere, but is it possible to take a photo with your Phone? coz mine is Huawei P8… Is it possible?? Of the Milky Way – or even a starry sky? Likely no, though there may be some software that will allow your phone to take long exposures, and you may be able to use a “tripod equivalent” with a phone. I’ve looked about the web for night photos taken with smart phones and have been sorely disappointed. Phones are getting better all the time, but they are not engineered for night photography. Any thoughts on finding the Milky Way in Northern WI? Headed there this weekend. Time for a pop-quiz: Based on the article above, what times are best to see the Milky Way in early June? And what direction should you look? Knowing these two things will help you determine where you may get the best view. Since we have never been in any part of Wisconsin (except, perhaps changing planes), we have no personal experience to relate. Very informative page. Just a question. I will be in Singapore on July 20th and Melbourne on July 27th. Any chance that it can be seen from there? Highly doubtful. Singapore is one of the most light polluted areas in the world. Some quick checking will show you that July 27, 2018 is the night of a full moon. See the article for links. We also have a lunar calendar for the year on our Calendar page. Gonna try and see it the week of August 4-11 in the Everglades, FL. It says sunset to 10pm but that is really only 2 hours. Any suggestions? Make good use of those hours! Other parts of the Milky Way will be visible, and you’re very likely to get some early Perseid meteors (the Perseid meteor shower peaks on the 12/13th). I have no knowledge of how dark it will be there, by the way. Oh, and don’t feed the alligators. I’m travelling to the Devils River SNA in TX on August 26th. Sunset is around 8:10 & moonrise is 8:28. Will I have any shot of catching the Milky Way? As in the Galactic core? Nope. That’s the night of a full moon. The moon will be in Aquarius on August 26, 2018… if were a slender crescent, you’d be in luck… but the moon is always near full stage if it rises as the sun sets. I figured as much, but I’m a noob when it comes to planning out trips that aren’t in new moon. Thanks! I’m from Algeria . Any chance that the milky way can be seen from here? when and where? Greetings, Holia! I’m quite sure you can see the Milky Way in any dark area of Algeria. See this link of light pollution, figure 6 for a map of Africa to help figure out where you can avoid light pollution. But away from cities and the northern coast, you have darker skies than almost anyone in Europe, or North America. Please send us a link to a picture when you take one! I’m going camping aug 9 10 11 12 in northwest Pennsylvania at some National forest. I looked on dark sky finder and it has black areas and it’s a new moon Aug 11 but I’m not sure what time to set up camera gear and shoot . Any tips on how to find what direction it comes up on ? Take a look at our animation above. That should give you what you need to know, Eric. Happy Milky Way and Meteor hunting to you! Thank you for your chart by month, that was just what I was looking for. I’m assuming October is near impossible due to the close proximity to sunset? I’ll be visiting New England around the 6th of October, and the moon looks like it’ll be cooperating at least. Any other suggestions for early October milky way photography? Thanks! Thank you for this great information! Approximately 7years ago I was in Madison,new Hampshire. We were out on the porch obviously stargazing. What we saw was a full view of the Milky Way on its access so that you could see the arms of it! Was that a special time that we were in a better position to see it? Nothing you have said is explaining that phenomenal view! In a dark, clear sky, the core of the Milky Way is splendid. One thing I haven’t pointed out is that while light pollution is a problem, it’s the combination of light pollution and water vapor or particulates in the air that it is the real problem. Those two elements scatter the light and hide the elements of the night sky. Glad you got at least one spectacular view. As I write this I’m located in an environment where the Milky Way is easy to see every evening (Alabama Hills, California for a workshop I am co-teaching). 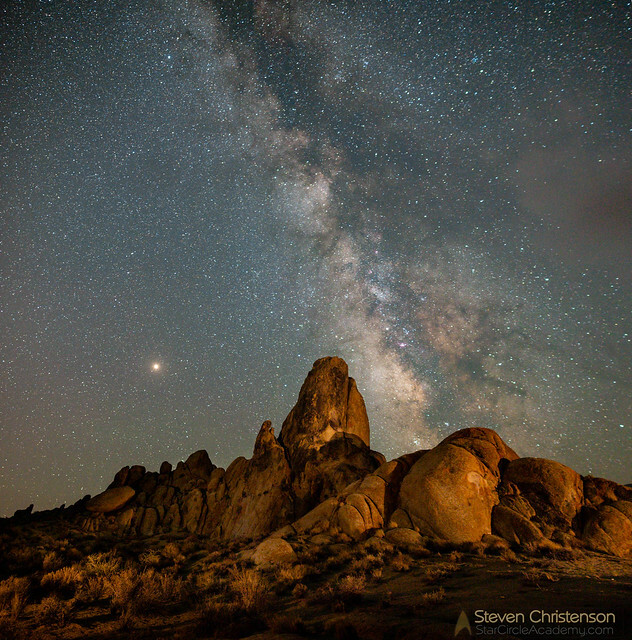 Awesome picture from Alabama Hills, Steven. A friend of mine was in Banff, Canada last week and sent me a picture of the same spectacular Milky Way. The BEST close-up picture of the Milky Way ever. I saw it in Hope, BC in July 2014. It was so close I could reach up and touch the Heavens. Hi Steve – just getting into this type of photography and reading everything I can. I have read that some recommendations are to leave the shutter open for minutes and some say that anything over 10 seconds create burred stars and star trails. What is your take on getting a crisp image of the milky way as far as exposure? Hello, Debbie, my friends call me Steven. Regarding your question, we have several articles on exposure, and one in particular on exposing for the Milky Way (Part 2 of the series). Don’t believe everything you read on the internet! Best of luck, and please share a capture. Also, be aware that now that it is mid September, your opportunities for capturing the core of the Milky Way are going to come to an end soon for this year. I’m going to Arches National Park in Moab, Utah next week and will be there near for the few days leading up to the new moon. After looking at this article (thank you for putting it up, by the way) I am afraid I’ll be too late in the year to catch the Milky Way, unless you might think otherwise. I’m hoping to get some good shots either way. Thanks again! I am going to be in Cabo San Lucas Nov 12-17. 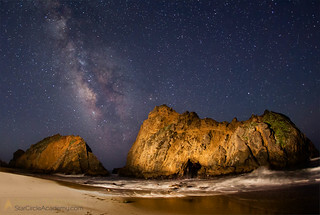 Any chance of photographing the Milky Way along the Pacific Coast during that time? None at all. See the charts of best times above. 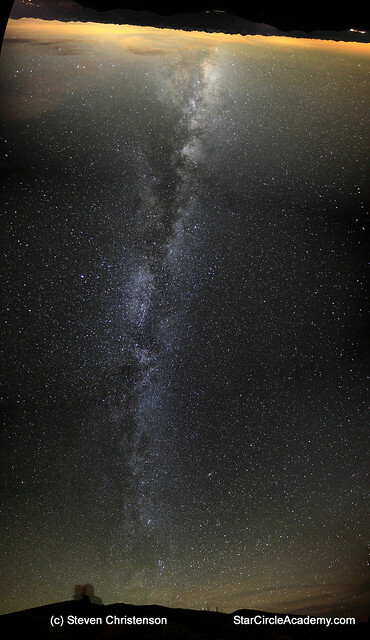 You can photograph the less-dense areas of the Milky Way, but not the core. I run a photo tour in October with one of the focal points being milky way photography. Your article says it is nearly impossible to see in October. The cover image to this page was shot on October 17th. https://photomagx.com/portfolio-item/lees-ferry-arizona-milky-way-photography-location/ You should also advise of a dark sky map which clearly shows were the skies are dark enough to see the milky way. I hope this helps. Unfortunately if we publish what you suggest about October, we fear a number of people will be frustrated. Mid to late October require a cooperative moonphase, clear views toward the horizon, sufficiently dark skies to capture the core of the Milky Way, and some skill processing the Milky Way to make it stand out against a sky that cannot be fully dark. We were wondering what you meant by “impossible” since the chart says “difficult” and realized that one of our introductory words used “nearly impossible” and per your observation we changed that to “difficult”. As for Dark Skies, we have two comments about that. 1. we have an article on the subject (actually more than one). and 2. As with suggesting that October may be a good time to catch the Milky Way, the use of “Dark Sky Finder” or other similar sites may help, but there is more to it than that. In the article, for example, we describe how you can capture the Milky Way near Santa Cruz, California which is not a dark sky area. Something that using a Dark Sky finder would NOT reveal. The trick is to pay attention to the DIRECTION that it needs to be dark, and the over-all light pollution in the area. It is true that Lees Ferry is very Dark, darker than almost anywhere else in the continental US and that is a good thing! But also as we noted in the dark skies article… darkness is not enough. You also need cooperative weather.